This Snake-Bark Maple Tree (Acer davidii 'George Forrest') will make a really worthwhile addition to any garden, particularly during winter when colour is lacking. Its distinguishing feature is its bark, which is a greenish-brown colour lined with white capillaries, hence its name. Its young shoots are red colour and its branches sweep in curves. Autumn sees the leaves change to fiery shades of red. Markedly smaller than our other Snake-Barked Maple, this tree will make an excellent choice for a small garden as this tree will reach a final height of 5m(16ft 8in). 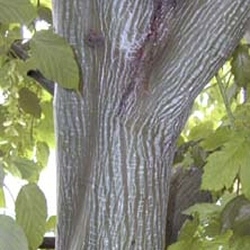 This Snake-Bark Maple is supplied at a height of between 1.5 to 2.0m in a 7-12L container, which means that the tree has an already established root system and therefore this tree can be planted any time of the year and with better results than either bare-root or rootballed trees. If you require many maple trees then click WHOLESALE MAPLE TREES where you can find trees from £0.81 pence per tree when buying 100. These are 40cm to 60cm tall.